Cardiff City boss Neil Warnock hopes the recovery and identification of Emiliano Sala will bring “peace” and “comfort” to his grieving family. 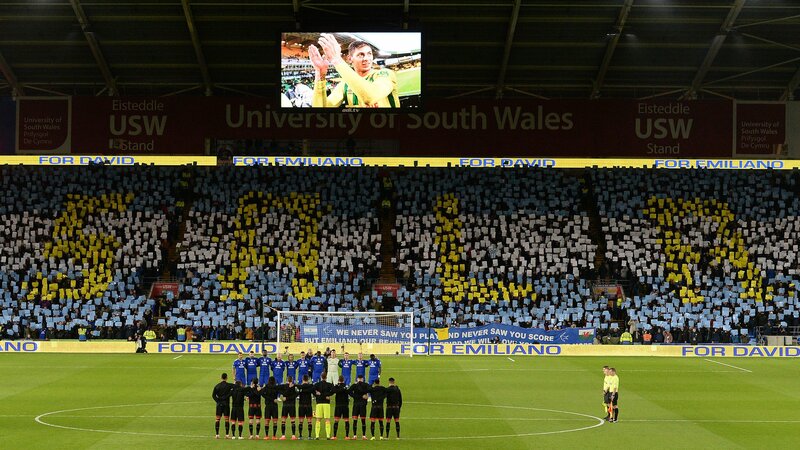 Cardiff will wear black armbands at Southampton on Saturday and St Mary’s Stadium will observe a minutes silence. Warnock confirmed Cardiff will to offer fund the repatriation of Sala’s body. Speaking for the first time since Sala was indentified, Warnock said: “It brings the family peace, offers them comfort. Cardiff paid a club record £15m to French club Nantes for Sala, but the striker did not play a game for them. But the Cardiff manager had fond memories of the player, saying: “I just think he was a Neil Warnock type of player really. I always thought he was a scruffy type of player who for me would score 10 to 15 goals every year but also work hard as a team player, fit every criteria really for what I look for as a player,” Warnock confirmed. “And at the same time he was a really nice lad. That would be my memory of him. “Because he wasn’t a young kid, he was at his prime, he had things to prove. He’d been in a comfort zone in France, but he’d improved every year for the past few years but I thought he was ready. “He was a little bit fearful of the challenge ahead but he knew he had to try and make that step. Previously Warnock had said he had considered resigning “24 hours a day, seven days a week,” in the aftermath of the tragedy. But he has dismissed those thoughts as Cardiff bid to stay in the Premier League. “My mind has been back on football, as it’s got to be. I steer the ship, but I have to say the boys and the staff have been great to me,” Warnock added. “That does matter when you’re a team off the field as well as on it. You could see the response at Arsenal from the players, probably the best away performance. He would not comment on Nantes demanding payment over the transfer fee, instead paying tribute to chairman Mehmet Dalman and chief executive Ken Choo. “I couldn’t be more grateful to Mehmet and Ken, who are keeping everything away from me. They’re dealing with that and I have enough on my plate in terms of on the field,” he said. But Warnock said the football family, including fans of other clubs, had rallied around the Sala family at their time of need. French World Cup winner Kylian Mbappe had been among the high profile players who had responded financially to fund the family’s private search for the aircraft and bodies. Scarfs and flags continue to be laid around the statue of former captain Fred Keenor in tribute to Sala and Ibbotson at the Cardiff City Stadium. Warnock said: “I had a walk around the stadium one night when nobody was around – it was nice to see the shirts from clubs in the lower divisions. It makes you realise it’s had a worldwide affect, the tributes hit home. “It shows that everybody is thinking on the same wavelength and it’s a loss to everyone in football. When you look at the finances they were able to raise to enable the search in the first place, I found that amazing. The response has been unbelievable.